For those of you not familiar with Hebrew, this entry won’t say much. For those of you who are familiar with it, it might say more. HP Laptops are bundled with a pack of CDs, meant for easy reinstallation/recovery on their laptops. These CDs can be used as the quickest method to recover the laptop to its original state. Since in Israel some laptops come with Hebrew Windows, and some come with English Windows, HP has decided to allow a per-customer selection. It means you get one CD for English Windows, and one CD for Hebrew Windows. 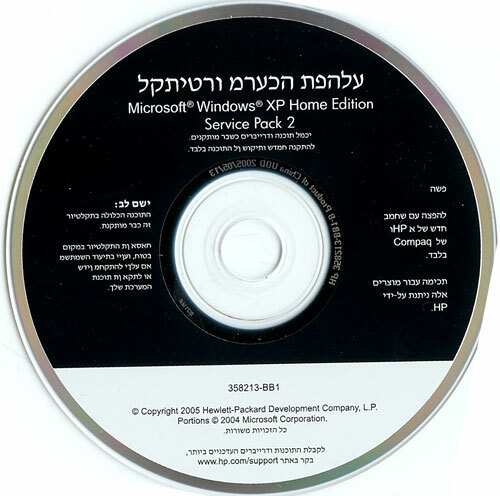 It’s only natural that on the Hebrew Windows CD, you’ll have Hebrew text. Hebrew is a funny language. written right to left, and not the other way around. It is not uncommon for a print sourced at a non-Hebrew country, or non-Hebrew related company to be written backwards, left to right. You get the hang of reading backwards when you’re long enough in the computers business. It might have been “Operating System Compactdisk”, but not quite. It goes on for every other Hebrew text on the CD, getting less terrible towards the bottom of the CD. Nice, still. This entry was posted on Wednesday, April 12th, 2006 at 2:08 am and is filed under Not Really Technical. You can follow any responses to this entry through the RSS 2.0 feed. You can leave a response, or trackback from your own site.